EUZEN play progressive electronic pop with a clear Nordic tone. 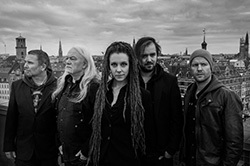 The band draws inspiration from several styles including classical music, hard rock, electro pop and folk. The music is groundbreaking and experimenting with a unique richness indetails, but always with a clear focus on the good melody. Euzen has made themselves a name on the alternative scene in Europe with two critically acclaimed album releases and numerous concerts in 2011, 2012 and 2013, The band has among others played at Wave Gotic Treffen (DE) Rudolstadt TFF (DE) Fusion Festival (DE) Colours of Ostrava (CZ) Castlefest (NL) and Movement Festival (RUS).